DiceChucker offers a couple nice features. First, and most importantly, it uses the Mersenne Twister algorithm for generating pseudorandom numbers. That's one of the best PRNGs (pseudo-random number generators) available, so you can be sure that the quality of these dice rolls is as random as you can get! It also stores your preferences automatically, and allows you to save and load sets of custom rolls. Finaly, DiceChucker includes support for some complicated rolls. Playing White Wolf? 5d10xs7! Need to roll damage in Savage Worlds? 1d6x+1d8x! 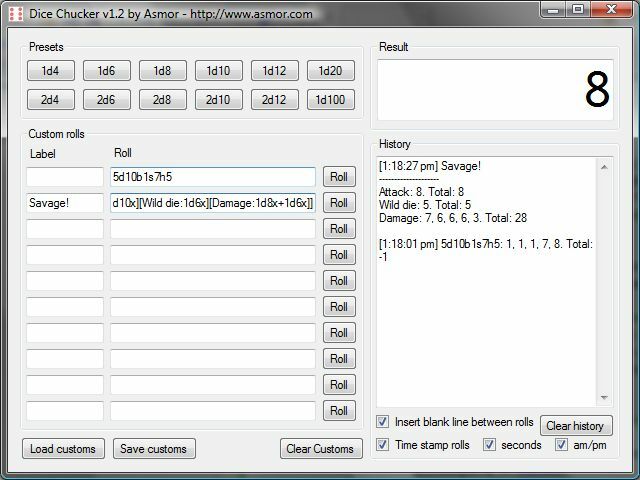 DiceChucker allows you to create complex custom rolls, and it parses them as "batches." For example, 2d4+3d8-5 would be parsed as 3 batches; 2d4, 3d8, and -5. Feel free to include as many batches as you want in a string! In addition, there are some special commands you can use to alter the way a batch is rolled. Exploding Dice: Exploding is when you roll an extra die if you get a certain threshhold; for example, in Savage Worlds, you reroll a die whenever you roll the maximum that die can roll. There are two ways to use exploding dice. 1d10x8: Rerolls as long as you roll an 8 or higher. 1d10x: Rerolls if you roll the highest possible on the die, in this case if you roll a 10. Equivalent to 1d10x10. Successes: Useful for dice pool systems, like White Wolf's, where you count how many success you roll rather than totaling the dice. 1d10s7: This indicates that a success is a seven or higher. Successes are counted as 1 for the total, and everything else is counted as 0. Botches: Related to succcesses (and only works if you're using successes), botch defines a threshhold where points are SUBTRACTED from your total! Remember, botches REQUIRE success to be enabled! 1d10s7b1: As above, this indicates a success on a 7 or higher. However, if you roll a 1, a point is subtracted from the total. High: Keep the highest dice. Like with exploding dice, there's two ways to do this. 4d6h3: Keep the highest 3 dice and total them. 2d20h: Count only the single highest die. Equivalent to 2d20h1. Low: Like highest, but only count the lowest dice. 4d6l3: Keep the lowest 3 dice. 2d20l: Keep the single lowest die. Equivalent to 2d20l1. So you're playing Savage Worlds, where every time you roll a skill check you also roll the savage die. You can roll both dice at the same time by creating multiple groups. A group is a dice batch enclosed by brackets, with an optional label. 5d10s7b1x: Roll 5 10-sided dice; if you roll a 10, roll an extra die. Count everything of 7 or higher as a success (+1), but each 1 you roll subtracts a success (-1). [Fighting:1d10x][Wild die:1d6x][Damage:1d8x+1d6x]: Roll three sets of dice called Attack, Wild die, and Damage, in that order. [Attack:1d20+10][Slashing damage:1d8+5][Holy damage:2d6]: Roll three sets of dice called Attack, Slashing damage, and Holy damage. Add a "player mode" which prevents tampering with the history. Extra banks of custom rolls. Verify integrity of random number generation. Allow customizing font size of history. Added a window to prominently display the total of the most recent roll.